Whichever MMA promotion you look to, the lightweight division is seriously exciting. The 155 pound division seems to be abuzz lately both in Bellator and the UFC. Eddie Alvarez is the new lightweight champion in the UFC. He knocked out Rafael dos Anjos in stunning fashion on a Fight Night card. Dos Anjos is a formidable opponent so to starch the once dominant champion in one round is impressive to say the least. In Bellator, Michael Chandler is the lightweight king and has been drawing eyes to his own work. He has been on a tear, finishing three opponents in as many fights. His last fight was a knockout victory over Patricky ‘Pitbull’ in which he regained the belt. After knocking out Patricky in spectacular fashion, Chandler leapt ontop of the fence, pointed in his brothers face and said: “You’re next”. Bellator are pushing ‘Iron’ Michael Chandler as the next big MMA star. He certainly has what it takes; the combination of skill, charisma and the ability to sell a fight. There are a number of possible match-ups in the future for Eddie Alvarez. It feels like everyone is gunning for the new champion at the moment. Tony Ferguson is furiously working his way up the rankings with a championship opportunity in his sights. Rafael dos Anjos is looking for a rematch and will face Ferguson, possibly for that opportunity, at UFC Fight Night: Mexico City. Khabib Nurmagomedov has had a strong case for a title shot for a long time now. There were rumours recently that the championship opportunity was in the works but that talk has since died down. Not only that, Conor McGregor is eyeing the 155 pound belt. McGregor is arguably the biggest star in combat sports right now and a fight against him would strap a rocket to the career of Alvarez. 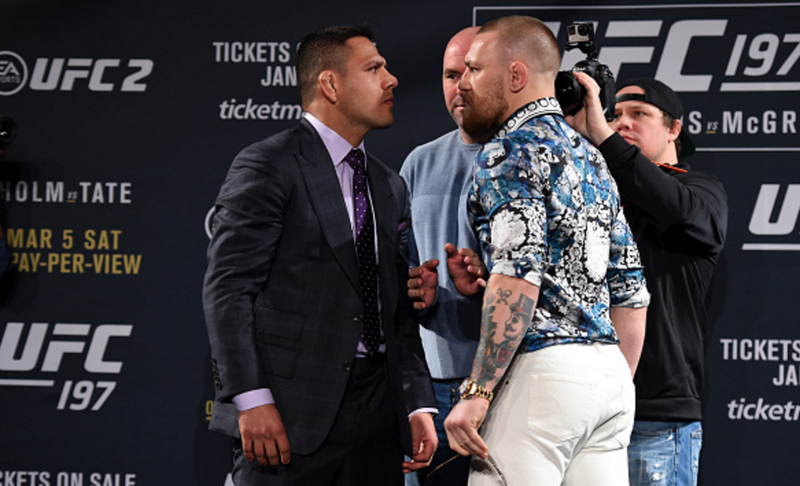 Conor looked to become a two weight class champion against dos Anjos at UFC 196. The fight fell through when the lightweight champion was forced to pull out with a broken foot. ‘The Notorious One’ wants to challenge for the 155 pound belt but this time, it could be without that of 145 pounds. Dana White has said that McGregor needs to defend his featherweight title against interim champ, Jose Aldo or give it up. One thing is for sure: McGregor vs Alvarez would make a lot of revenue and could be a really fun fight. Exciting things are ahead for the Bellator lightweight champion also as he faces Benson Henderson next. Benson Henderson is of course a former UFC champion who has recently started fighting for Bellator. That could be a great fight. Henderson won the opportunity against Patricio Pitbull, the man Chandler screamed at after knocking out his brother. Patricio was looking for vengeance but a leg injury in the fight with Henderson at Bellator 160 put a swift end to that. Interestingly, the two lightweight champions have a history. Eddie Alvarez and Michael Chandler have fought twice in Bellator. They are one win apiece with Chandler submitting Alvarez in 2011 and Alvarez winning by split decision when they fought again in 2013. Both men are now the title holder in their respective promotions. Funny how things work out in MMA. In any event, 155 pounds is an exciting division in the sport generally. Some promising fights are in the pipeline, big things are in store for MMA fans. BellatorBellator lightweight championshipBellator lightweight divisionConor McGregorEddie AlvarezKhabib NurmagomedovMichael ChandlerMMARafael dos AnjosTony FergusonUFCUFC lightweight championshipUFC lightweight divisionwho will be Eddie Alvarez's first title defence?who will Conor McGregor fight next?who will Eddie Alvarez fight next?will Conor McGregor give up the featherweight title? Next Next post: Is This The Shocker in Spider-Man: Homecoming?